A wonderful review, of a wonderfully beer-filled venue. I must say the lack of parma (for gluttons such as myself) is well truly made up for with the abundance of quality Victorian beers. On a parma tangent: I am *still* waiting to see (and eat) a parma the size of a toilet seat – the benchmark for over-sized foods. Perhaps an EDS trip to Palmerston Hotel in South Melbourne is in order. After all, the establishment is a winner of the much coveted title of Best Parma. That should count for at least a cursory visit, right? 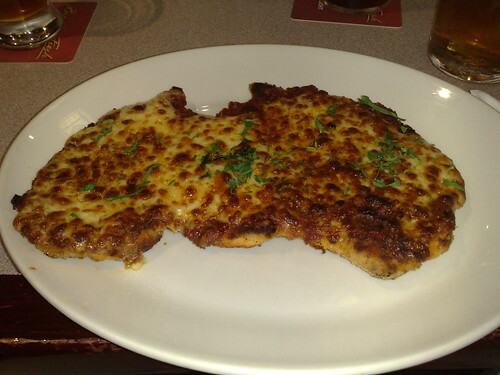 @Tris – I don’t know of anywhere that serves such large parmas but you I’d be up for a toilet-seat-sized one, hehe. Yeah, I’d go back for their lovely beers. @Ryan – Palmerston Hotel, eh? Hehe any excuse for a pub night, of course! Who awarded them ‘Best Parma’? We should organise something next month, if you like! Hi there, JJ. I’d go again to Mrs Parma’s but definitely not for the parmas – but because I’m a big fan of microbreweries and their products. But to be honest, I’ve eaten countless pub chicken parmas – how is one exactly supposed to find out whether or not the chicken is hormone-free? Don’t think I’ve eaten at Grace Darling, must give that a shot when I’m in the area.